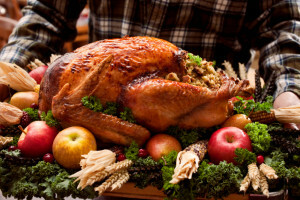 The Thanksgiving dinner or the Thanksgiving feast symbolizes the tradition and custom of the families having the dinner together on the Thanksgiving Day. A traditional picture of Thanksgiving dinner may involve a loving family, a festive dining table, designer placemats on the table, glowing candles and the finest crockery generally used on special occasions like this one. At the first Thanksgiving celebrations the tough, resourceful, able to fly and hard to catch, turkeys were not the first choice of either the pilgrims or the Native Americans. This creature was so tenacious that Benjamin Franklin suggested it to be revered as our national symbol. (But the Bald Eagle ultimately won the honor by a feather.) It is believed that the turkey was the main course of the Thanksgiving feast at the first harvest festival therefore it has been adopted through time, as the model for Thanksgiving Dinner. So the turkey is observed as a compulsory dish of the Thanksgiving dinner even today. No matter through which method it is cooked but the golden brown, with stuffing and gravy on the side turkey remains the main attraction of the Thanksgiving dinner and keeps whetting the appetites of all those present there. and Fruit and Holland Cheese. Today a wide variety of dishes have been included in the Thanksgiving dinner along with the turkey, yet the traditional turkey is still the meat of choice. There is a large variety of food to choose from for a perfect Thanksgiving Dinner such as goose, duck, ham, some of the sea’s harvests, sweet potatoes, peas, rice dishes, greens, and even more exotic vegetables. All these items together make the celebrations of Thanksgiving Day even more tasteful. The main idea behind finalizing a perfect Thanksgiving menu is to choose those dishes that represent the idea of giving thanks for a good fortune, a good harvesting season, and the sharing of the bounty of happiness with friends and family.